Myanmar (Burma) is a country that covers 676,578 square kilometres (about the size of France) and has a population of 52 million. These people are made up of a striking array of different ethnic groups, which include Bamar/Burmese (by some distance the largest in number), Shan, Karen, Kachin, Chin, Mon, Han Chinese and Indian, to name but a few. The former capital Yangon, also known as Rangoon, remains Myanmar largest city and continues to be the country’s most important commercial hub and gateway for most of its international visitors. Its colonial background and religious legacy make it one of the most mesmerizing and genuine places in all of Southeast Asia. Upon arrival at the airport, you will be warmly welcomed and accompanied to your hotel for check-in. Visit Kyaukhtatgyi Pagoda, which is home to a 72 meter long reclining Buddha statue that features detailed carvings on his feet. Afterwards, you continue through town in order to make a quick stop by the Royal Lake located in Kandawgyi Park which is very popular with local residents, especially in the early morning and around sunset. Catch a view of Karaweik Hall, a reproduction of a royal barge and enjoy a spectacular view of the Golden Shwedagon Pagoda. No Myanmar expedition can be considered truly great if it’s lacking a visit to the legendary Shwedagon Pagoda. Ready for an amazing experience? The visual delights present there alone, are worth the trip. Witness the colors transform on the 100-meter chedi which is literally enclosed in over 40 tons of gold leaf. You will start at the eastern staircase where you will find a row of shops at the base of the temple selling various religious items. Here you will find monks robes, alms bowls, offerings, incense and other unique Buddhist objects. As you browse the stalls your guide will explain the use and rituals of Myanmar’s Buddhist people. Shwedagon is largely considered to be the most important religious site for the Burmese; most visitors report that the trip is extremely memorable and still etched into their minds. After sunset head on to Mahabandoola for a change of scenery. Check out the busy night market surrounded by the colonial building. Munch on some of the tastiest street snacks and mingle with the friendly Yangonites as you enjoy the lively atmosphere. Transfer to the airport for your flight to Bagan (flight not included, to be booked by agent). Welcome to Bagan, known as one of the greatest architectural sites in Asia. The majestic Bagan, about the size of Manhattan, with its more than 4,000 temples made of red bricks, is one of the highlights for each Myanmar travel and a visual treat for any holidaymaker. Upon arrival, you will be transferred to your hotel for check-in (official check-in time is 2 pm). Your first port of call is an elevated location amid the temple plains to see the fields and pagodas of Bagan. From here you will have a look at the Ananda Temple – one of the most exalted of Bagan’s temples. We will ensure that our tour reaches this point before the majority of tourist arrivals, enabling you to enjoy the splendor of the temple in relative tranquility. Continue to various other temples dotted around the temple plains to experience a variety of architectural styles in the area as well as the artistic wonder of the 9-14th centuries. Traveling amid the temples you will get a taste of rural Bagan life in this ‘living museum’ setting where farmers and families work amongst the monuments. You will be driven late in the afternoon to the jetty where a private wooden river boat awaits you. Sitting either under the shade or on the open-deck you’ll be treated to fabulous views as you cruise down the Irrawaddy River. You’ll cruise past several small villages, fishermen, local boats and of course many of the ubiquitous Myanmar Buddhist temples. The views of Bagan from the river are particularly spectacular and offer a different perspective from the land-based tours. As you finish your delicious and refreshing cocktail and the sun begins to sink slowly from view, you will prepare to disembark before being driven back, greatly relaxed, to your hotel for the evening. The perfect end to a busy day of sightseeing in Bagan! After breakfast at your hotel, your guide and driver will pick you up to start your Bagan excursion. It’s off to the vibrant Nyaung Oo Market, where the locals come to trade fresh produce and other goods daily. From here you will start with a visit to the renowned Shwezigon Pagoda, constructed by King Anawrahta in the early 11th century as a religious memorial. Travel over dusty lanes and tree-shaded roads past temples and monasteries to a small village. Explore the village on foot, getting a glimpse of local lifestyles of Bagan’s residents. Continue to more lesser-known monuments, selected based on your interest, in the area for the remainder of the morning. If you wish, a short walk can be arranged through a series of smaller monuments which allows for a unique perspective of Bagan. From here you will journey on by horse cart for an excursion that passes Thatbyinnyu, the tallest temple in Bagan and the gigantic Dhammayangyi Temple noted for its remarkable brickwork, among others. Take pleasure in an extraordinary sunset from the upper terrace of one of the surrounding temples. Transfer to the airport for the flight to Heho (flight not included, to be booked by agent). From Heho, you will experience a lovely scenic one-hour drive (32km – 1 hour) which leads to Nyaung Shwe, gateway village to Inle Lake. Along the way, you will have an opportunity to visit rural workshops that specialize in traditional Shan paper and unique handcrafted umbrellas. Upon reaching the edge of the lake, take a short orientation tour of Nyaung Shwe, a small town of narrow streets dotted with temples, monasteries, tea shops and local houses. Then you will board a private motorboat and begin heading out onto Inle Lake, one of Myanmar’s most spectacular and breathtaking sights. Its calm waters are dotted with floating vegetation and fishing canoes, to which scenic hills provide the perfect backdrop. Along the way, you will pass several villages that are built on stilts over the lake, which are inhabited by the local Intha people. Observe the daily activities of the local leg-rowing fishermen and see their floating gardens, which are built up from strips of water hyacinth, earth and anchored to the bottom of the lake with bamboo poles. You will also visit Nga Hpe Chaung Monastery, which houses loads of early Shan Buddha Images. In the past, this temple was known for its jumping cats but these days there are only a few felines roaming around and none are jumping anymore. Yet the Buddha images are still worth the visit. Proceed to the Phaung Daw Oo Pagoda, the lake’s main haven, which contains five sacred images of Buddha decorated in gold leaf. There are also many traditional crafts originating on Inle Lake and, should you wish, we can stop for a visit to one making incredible woven items from lotus silk, boat builders (depending on the time of year), a cigar making workshop, blacksmiths or even silversmiths. The day will come to a close with a return trip by boat back to your hotel. After breakfast, you’ll pay a visit to the lake’s morning market (the market is open every day apart from the dark moon and full moon calendar days). The market’s location rotates between the lake’s villages in a 5-day schedule and is also visited daily by the lake’s inhabitants as well as the surrounding natives who also come to sell and trade their wares. A 1-hour boat ride down a small canal will take you to the Pa-Oh village of Indein, positioned on the western shores of Inle Lake. Take a leisurely stroll around the village before ascending to the top of a hill. Once you’ve arrived at the summit, you will be greeted by an iconic Buddha image which sits enshrined among hundreds of stupa ruins and overgrown shrubbery. The Indein Pagoda complex is undoubtedly one of the most amazing sites around the shore of the lake and it consists of hundreds of small stupas which are overrun by moss and greenery. As an exciting day comes to close transfer back to your hotel for some well-deserved relaxation. Enjoy your last boat ride from your hotel on the lake to Nyaung Shwe. From Nyaung Shwe you’ll be transferred Heho Airport (1 hour) for your domestic flight to Mandalay (flight not included, to be booked by agent). Mandalay, the second largest city of Myanmar and one of the ancient royal capitals is often perceived and described in the literature as Asia at its most traditional, timeless and alluring but those who go meet a booming and vibrant city located on the banks of the Irrawaddy River. However, despite the energy and thriving business, it’s where the cultural heart of Myanmar lies and tradition of music, dance, and drama are still alive. Upon arrival in you’ll be transferred (1 hour) to Mandalay city. You will start your tour with a visit to the Mahamumi Pagoda. This pagoda houses one of the country’s most honored Buddha images, completely covered in gold leaves that are every day applied to the statue by male devotees. Mandalay is also famous for its expert craftsmen and as you explore these traditional workshops you’ll discover why this is the case. See the manufacture of wood carvings, kalaga tapestries, and gold-leaf first-hand; and bear in mind the methods used in their creation are the same as those used ages past in the Royal Court. In the afternoon, you will visit the Kuthodaw Pagoda, frequently dubbed as “The World’s Biggest Book” for its collection of 729 marble slabs inscribed with Buddhist teachings. Directly south of Mandalay Hill stands the Kyauktawgyi Pagoda, known as the pagoda of the Great Marble Image. Admire the huge Buddha, carved from a single block of marble. It’s said that the colossal marble block took 10,000 men almost two weeks to transport it from the riverside to its current location. Then it’s off to the Shwenandaw Monastery, the Golden Monastery that is the only enduring structure from the Royal Palace of the 19th century. This impressive structure is celebrated for its remarkable woodcarvings. Before sunset, you will make a trip to Amarapura, Myanmar’s penultimate royal capital. Amarapura means “City of Immortality”, though its period as capital was relatively brief. You will start Mahagandayon monastery, home to more than a thousand young monks and renowned as a center for monastic study and strict religious discipline. Continue on foot or by bus a short distance to the legendary U Bein Bridge, which was built in 1782 when Amarapura was the Royal center of attention. It spans 1.2 km across the shallow Taungthaman Lake and is said to be the longest teakwood bridge worldwide. Enjoy this very special atmosphere as the late afternoon sun casts long shadows and illuminates the local people heading home. Transfer to the airport of Mandalay for your flight to Yangon (flight not included, to be booked by agent). You’ll be taken downtown and start your tour on Mahanbandola Road where the Immanuel Baptist Church, originally built in 1830, is located. Continue east passing a couple of alleyways crammed with food stalls and markets. Turn right onto Pansodan Street with its many stalls selling second-hand and photocopied books. You’ll pass the High Court Building, the grand Inland Water Transport offices and even grander Myanma Port Authority building until you’ll reach Strand Road. Your next stop will be outside of the majestic Strand Hotel and walk along Strand Road until you’ll see the Customs House and the Law Court, an impressive-looking colonnaded building. Turn north onto boisterous Bank Street and up onto Sule Pagoda Road, where you can consult one of the many fortune tellers who hang out under the trees. Be sure to make a photo stop at Sule Pagoda, downtown’s symbol whose construction dates back to over 2,000 years ago and have a glimpse of Independence Monument and Mahabandoola Garden. After a complete rotation seeing the twice rebuilt City Hall continue west down Mahanbandoola Road through the chaotic Indian and Chinese quarters. Explore the gold shops of Shwe Bontha Street and have a look from outside at the Moseh Yeshua Synagogue on 26th street. You’ll reach Theingyi Zei market, where you can engage in a little pickled-snake hunting. Exit onto Anawratha Road until you reach into the Sri Kali temple, Yangon’s most colorful Hindu temples. Unfortunately, it is already time to say goodbye to one of the most impressive and enchanting countries in the world. Depending on your flight schedule, you can go on your own at Bogyoke Market, better known under the name of “Scott Market“ to stroll through the stalls filled with handicrafts and do your last minute shopping (the market is closed on Monday and during the holidays). Transfer to Yangon International Airport, check-in for departing flight home. 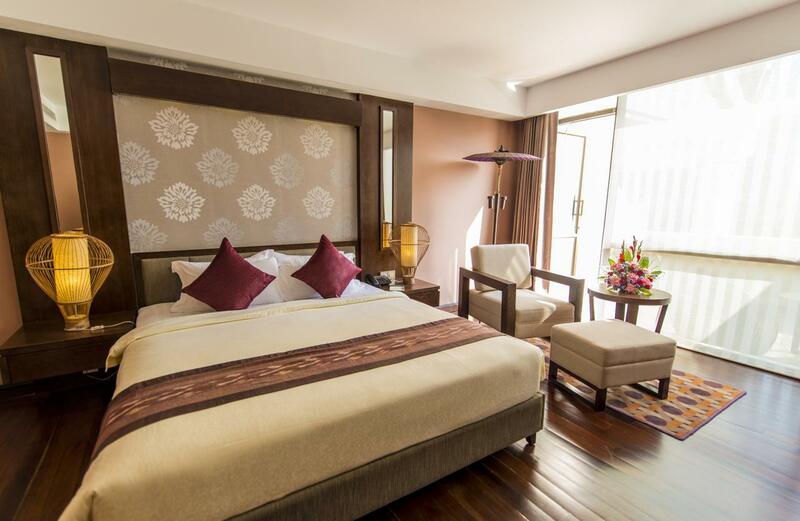 Located closely to the central business district of Yangon, Rose Garden Hotel offers well-appointed accommodations with free WiFi and surcharged shuttle services to several attractions. The hotel is just a 30-minute drive from Yangon International Airport. This hotel is suitable for both business and leisure travelers. With its complete range of facilities, guests will also find a business center and fully-furnished day offices for rent on site. The 50 feet outdoor pool is perfect for those who wish to enjoy swimming in the sun. On-site parking is possible for any guests who drive. Offering garden views, each room here will provide all guests with a cable/satellite TV, air conditioning and a seating area. The private bathroom comes with free toiletries, slippers and a hairdryer. Other facilities and services available at the property include laundry and car hire. The Foyer Bistro serves both local and international dishes.